Boxed wine may not be considered the classiest option, but hey, it's actually a great way to save money and reduce your environmental impact (since it's packaged in bulk rather than individual bottles). It also stays fresh longer than bottled wine, so you can drink just a little bit at a time over a longer period without ruining it. The number of glasses of wine in a wine box depends on the size of your pours and whether you're drinking red or white wine. Three liters is equal to 101.4 ounces, and five liters is equal to 169 ounces. 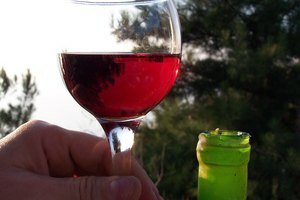 A red-wine glass holds 10 to 14 ounces. Assume you’re pouring 10-ounce glasses. A three-liter box would then yield 10 glasses of red wine with a little splash left over. A five-liter box would yield about 17 glasses. A white-wine glass holds six to 12 ounces. 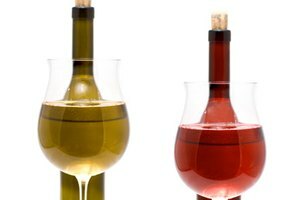 If you’re pouring 6-ounce glasses, a three-liter box of wine would provide about 17 glasses of white wine. A five-liter box would provide about 28 glasses. Ultimate Bar Book: The Comprehensive Guide to Over 1,000 Cocktails; Mittie Hellmich; 2006. Joseph Slama received a Bachelor's degree in English from the University of Colorado in Boulder. He lives in New York City, where he is pursuing a Master's degree at City College.